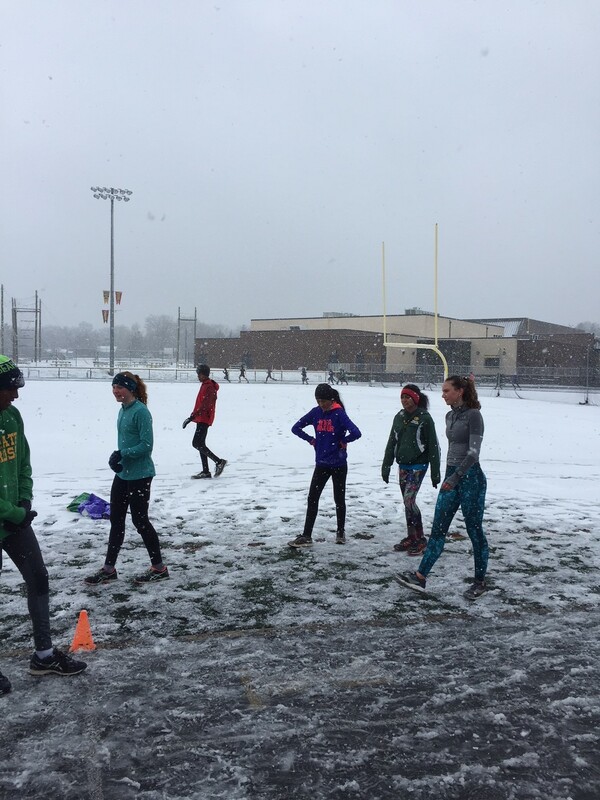 Saturday 4/7/18– 10 mile time trial, Sameer led the team with a 56:50, Jillian led the ladies in 1:11.59, 10 minutes warm up- 5 minutes cooldown. Friday 4/6/18– most kids ran 15 min up, SDS (8) followed by 2 x 1600m at goal 3200 with 8 min rest between followed by 6 x 75 sprints with over-unders. Top diggity dogs and gals ran 2x 1600m at goal 3200 followed by a fast 800m- rest interval was 8 min. 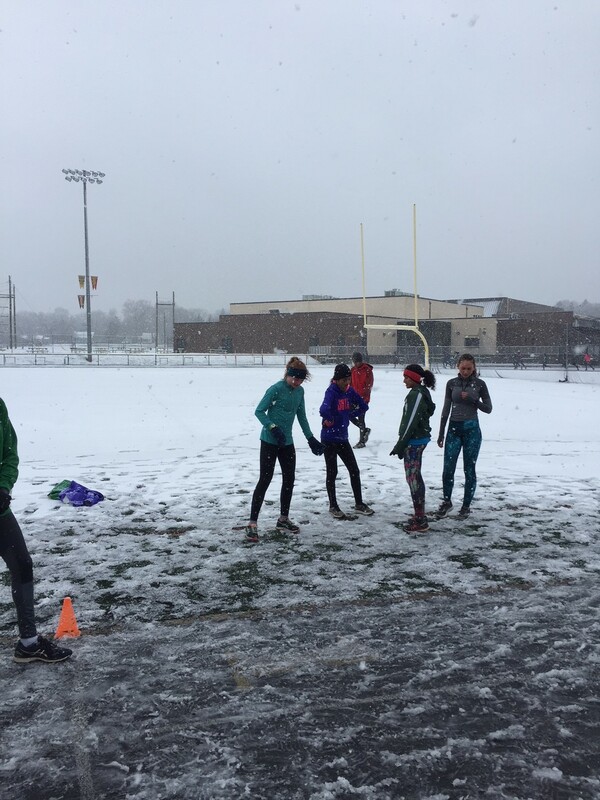 Sameer led the dudes with 4:34/ 4:33/ 2:08, Ladies were led by Kelsey and Kavya in 5:35(KK)/ 5:34(KK)/ 2:35 (KT), followed by same 6 x 75m with drills. Md group ran 2 x 500m at goal 800m pace followed by 5x200m at goal 800m pace. Adwin led the charge in 71/ 72 and 27ish, two laps down. Good day- breezy, early, and cold. kids finished with an upper body lift. Wednesday 4/4/18– Big 15’s followed by lower leg drills, 10:00 warm up, quick stretch, most kids ran 10k up tempo followed by 11 x 150m. very top kids were on the track for 4 (ladies)- 5 (dudes) of LT work followed by 11x150m. Tuesday 4/3/18– 65 minutes followed by lower body lift. 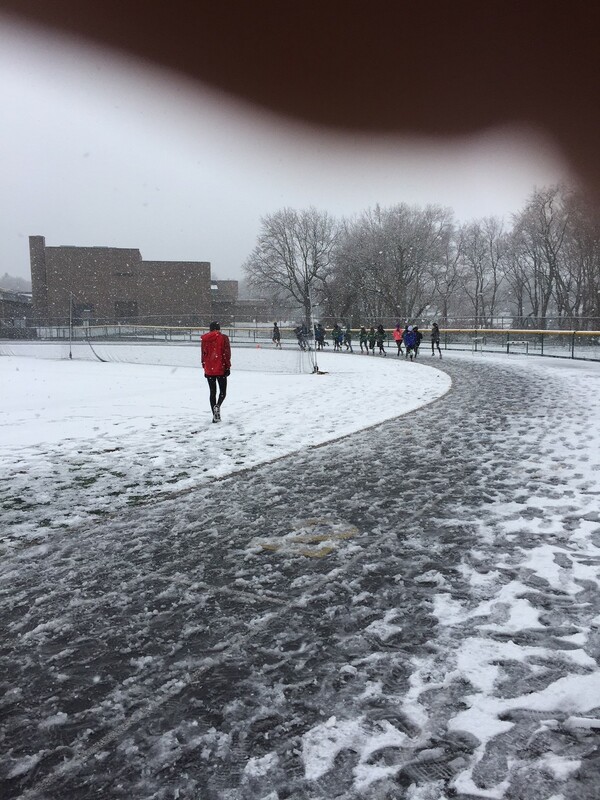 Monday 4/2/18– 15:00 up, quick stretch- bulk 400’s in the snow. Top dogs ran 30x400m on a 1:55 cycle, avg’d 73-75, Kelsey led the ladies wit 25x 400m on a 2:10 c with n 82-3 avg. 2 laps down.